The art, stories, and media that a culture produces are integral parts of understanding that culture. “Canadian Whites” is a blanket term referring to a comic book movement which started in response to the Wartime Exchange Conservation Act which was enacted when Canada joined the Allies against the Axis powers during the Second World War. The Wartime Measures Act restricted the flow of non-essential goods across the border between Canada and the United States of America. This created a dearth of many leisure products, including comic books. The Whites were completely Canadian productions, as they were comics created by Canadians for Canadians. Reading through the Canadian Whites makes it obvious that they are products of their time, and heavily influenced by the war. But as you continue to read through the stories, troubling patterns emerge, patterns which echo one of the darker and often repressed parts of Canadian history, the treatment of Japanese Canadians during the Second World War. Examining the creative media of a culture can provide us with a reflection of its values, beliefs, and morality. 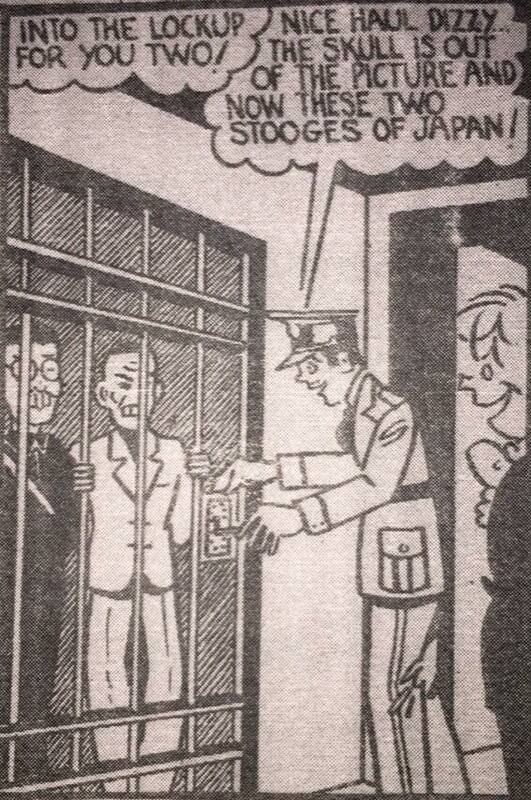 Dime Comics No.18 (December 1944) provides a useful lens to examine and understand this aspect of Canadian history. 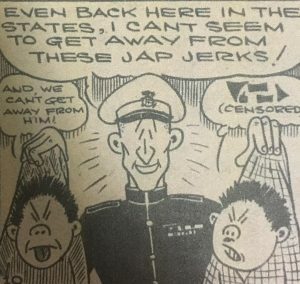 The stories within this comic provide an unfettered look at the widely held and socially accepted bigotry of the time, which targeted people of Japanese descent. When examining the Canadian Whites, it’s important to understand the cultural context in which they were made. 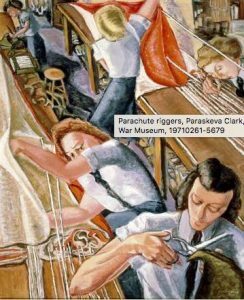 Even before the Second World War broke out, there had been long standing resentment against people of Asian descent in Canada. According to Ann Gomer Sunahara in her book “The Politics of Racism: The Uprooting of Japanese Canadians During the Second World War”, people of Asian descent were considered inferior to people of European descent. Sunahara describes this as a “passive, unconscious racism” (3). Passive, not in the sense that it wasn’t harmful, but rather that it was the prevailing ideology of the time and it promoted negative stereotypes of those of Asian descent within Canada. Citizens of European descent would not have considered themselves as racist, as they were adhering to the social conditioning which led them to believe in inherent differences between themselves and their Asian counterparts. European Canadians had been born and raised in a culture that perpetuated this narrative, which was of their supposed superiority over those of different ethnicities. 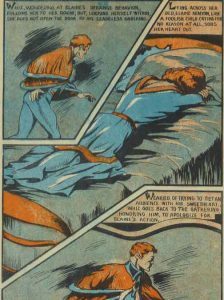 These beliefs can be seen in exemplified in several stories within Dime Comics No.18. H. Brunt. Panel from “Lank the Yank” Dime Comics, No. 18, December 1944, Bell Features, p. 43. Bell Features Collection, Library and Archives Canada. 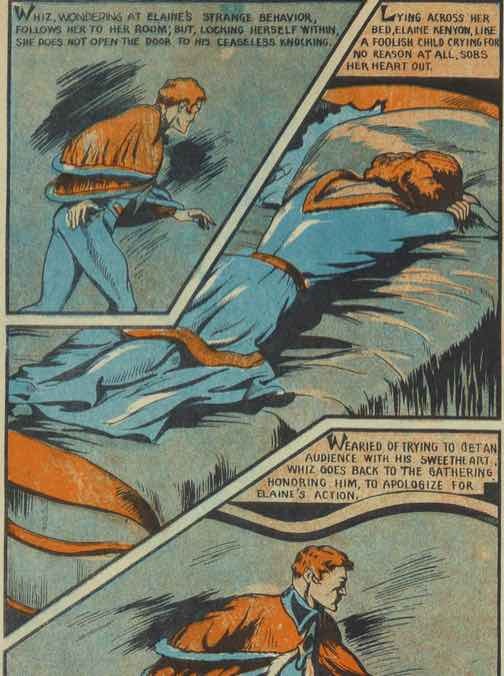 One of the stories within Dime Comics No.18 is an episode in the continuing series “Lank The Yank”, a comic series created by Harry Brunt. In this episode, the titular Lank encounters a group of Japanese soldiers. 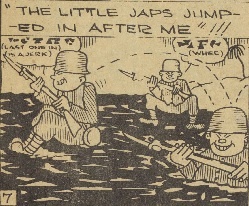 When Lank retreats into a nearby body of water, the Japanese soldiers pursue him and foolishly end up drowning like lemmings. 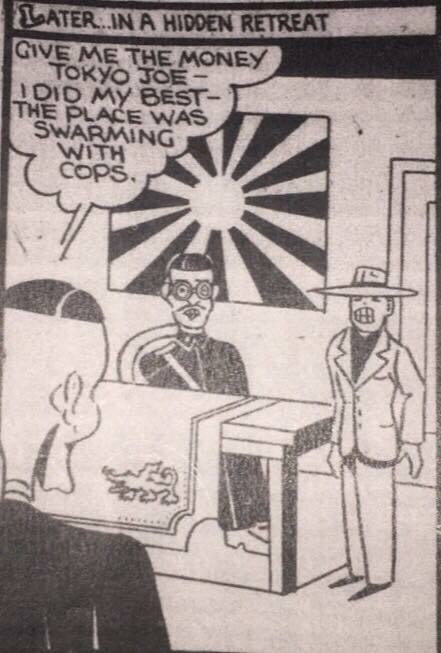 The comic portrays the Japanese as being too stupid to not walk into danger. It also portrays them as not having the ability to swim. Finally, they are mocked for being short as they drown in water which Lank strides through easily (pg 9). Lank in contrast, is smart enough to lure them to their doom. The message from this comic is that the Europeans are biologically and mentally superior. This comic makes the Japanese objects of ridicule and makes the death of three human beings an ethnic joke. 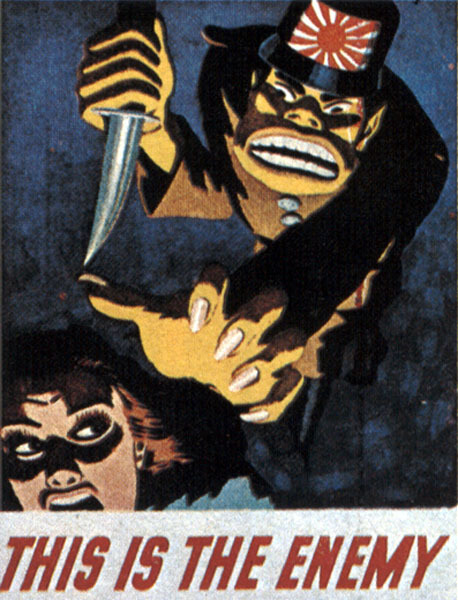 “Lank the Yank” summarizes the culturally systemic prejudice of Canada in the 1930’s-40’s. A. Dingle. Panel from “Rex Baxter and Xalanta’s Secret” Dime Comics, No. 18, December 1944, Bell Features, p. 43. Bell Features Collection, Library and Archives Canada. In the essay “Henri Tajfel’s ‘Cognitive Aspects of Prejudice’ and Psychology of Bigotry” Michael Billig examines the work of past articles regarding the social psychology of prejudice. According to Billig, as humans we have an innate need to organize and categorize both physical and social information about the world that we inhabit. Humans, he suggests, create cognitive shortcuts which allow our minds to make sense of the vast swaths of information around us. These cognitive shortcuts help us to make sense of this information. However, these categorizations can distort our understanding of reality, especially when this leads to defining people as members of a larger social group, rather than as a collection of individuals. Individual human beings of any culture are infinitely more complex and varied than any characterization of race or ethnicity could allow. Broad characterization, suggests Billig, leads to exaggeration and the presumption of stereotypes. In this way, prejudice can be defined as as a “cognitive interpretation of the social world” (178), a false understanding of people based on misinformation gained from one culture about another. 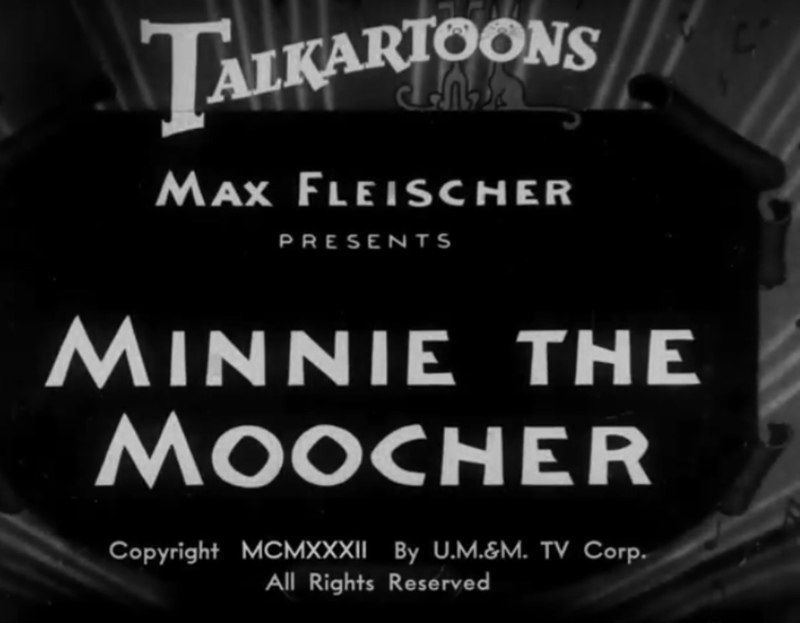 An example of such exaggeration can be seen in the first story of Dime Comics No.18, “Rex Baxter and Xalantana’s Secret”. In this episode of the comic series “Rex Baxter”, the main antagonist, a Japanese general, is little more than a racist caricature with exaggerated physical and behavioral features, depicting Japanese people as physically ugly and violently sadistic. The general has huge buck teeth, while all other Japanese have eyes so slanted they appear to be closed. They speak in broken, grammatically incorrect English, and talk of taking women as prizes of war, which is clearly meant to imply some inherent savagery. In the study “Teaching About Racism: Pernicious Implications of the Standard Portrayal” by Glenn Adams, Vanessa Edkins, Dominika Lacka, Kate M. Pickett and Sapna Cheryan, racism is understood less as a personal problem and more of a cultural one. It’s easy to understand racism as the problem of individual minds, but that does little to address the root issues. While there are certainly individuals who hold racist ideals, the true danger in racism lies in ingrained socio-cultural bigotry, or as they call it “the essence of racism” (350). Racism over time becomes embedded in collective rhetoric, which is then in turn used to justify itself. 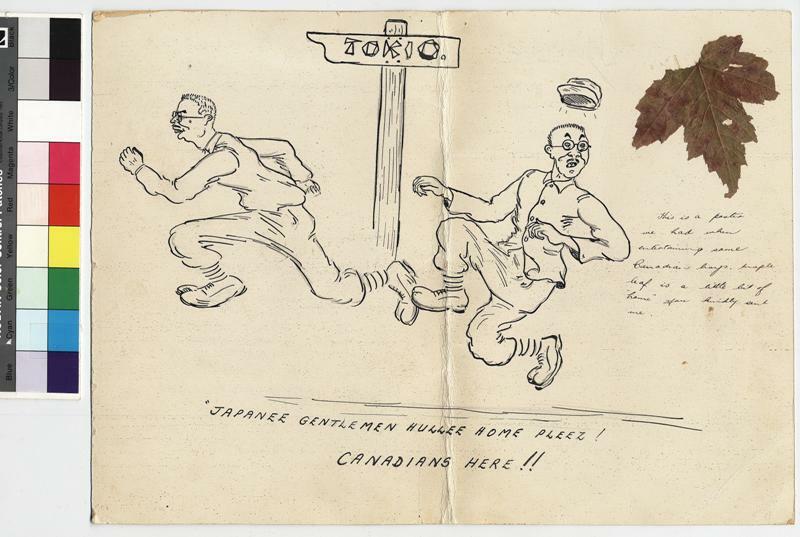 The representations of the Japanese soldiers matters, as these caricatures add to the rhetoric of the time. 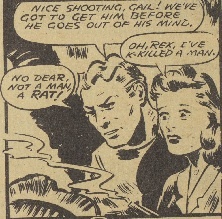 One particularly poignant line in “Rex Baxter” is delivered by Rex Baxter after his companion Gail expresses trauma after taking the life of a Japanese soldier. Rex responds by saying “No Dear, not a man, a rat!” effectively reducing those of Japanese descent to vermin, to be killed indiscriminately (5). This bigotry and devaluing of the lives of people of Japanese descent became common within Canadian culture, and was present at the highest levels of the Canadian government at the time. Sunahara references the now infamous quote from Prime Minister William Lyon Mackenzie King personal diaries, “It is fortunate … that the use of the bomb should be used on the Japanese rather than upon the white races of Europe” (15). The Prime Minister is of course referring to the atomic bombs launched by the Americans on the Japanese cities of Hiroshima and Nagasaki, clearly valuing the lives of European civilians over those of Japanese heritage. When discussing the Canadian Whites and their representation of people of Japanese descent, it’s important to remember for whom they were made. 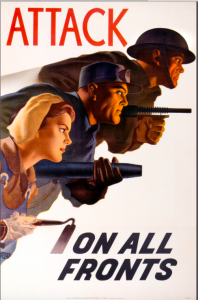 The Whites weren’t created for those soldiers actually fighting against Japan and the other Axis Powers during the Second World War, but rather for those on the home front. Canada in the 1930’s to 40’s was an increasingly paranoid country. As the war dragged on, the public became more and more irrationally concerned that those of Japanese descent were waiting for an opportunity to harm Canada. As Ann Gomer Sunahara reports, particularly in British Columbia, the general consensus was suspicion and a lack of trust for those of Japanese racial origin, and a mistaken belief that their continued presence in Canadian society was a threat to public safety. Sunahara notes that astoundingly, both the Canadian Military and the Royal Canadian Mounted Police were firmly of the opinion that those of Japanese descent within Canada were not any kind of liability, “at no point were Japanese Canadians ever a threat to Canadian society” (3). One of the most colourful ways of understanding the phenomenon comes from essay “The Canadian Japanese and World War Two” by Forrest E La Violette, which describes popular public opinion as a crescendo of demands to remove the Japanese from Canadian society. L. Bachle. 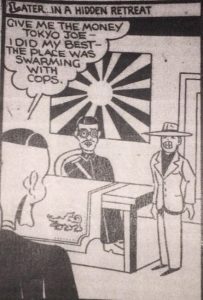 Panel from “Johnny Canuck.” Dime Comics, No. 18, December 1944, Bell Features, p. 43. Bell Features Collection, Library and Archives Canada. The Canadian public, in their fear, stopped seeing those of Japanese heritage as individual human beings, but rather as a part of some great amorphous “other” with which their country was currently at war. The depictions of Japanese people in the Canadian Whites were symptomatic of the culture they were produced in. 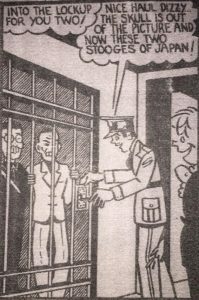 In the episode “Johnny Canuck” in Dime Comics No.18, by Leo Bachle, the titular Canadian spy Johnny Canuck is deceived and betrayed by a Japanese man masquerading as a Chinese official. 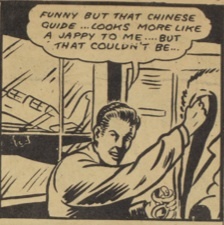 Even before the betrayal, Johnny Canuck says that the spy looks “like a jappy”, implying some inherent untrustworthiness based on his appearance (43). According to Audrey Kobayashi in her paper “The Japanese-Canadian Redress Settlement and its Implications for “Race Relations”, she suggests that there had always been discrimination by European Canadians against those of Asian descent. However as the war kept going, and the Japanese were more and more vilified, the war became a perfect excuse for more bigoted voices within Canada to call for the ejection of the Japanese Canadian population. 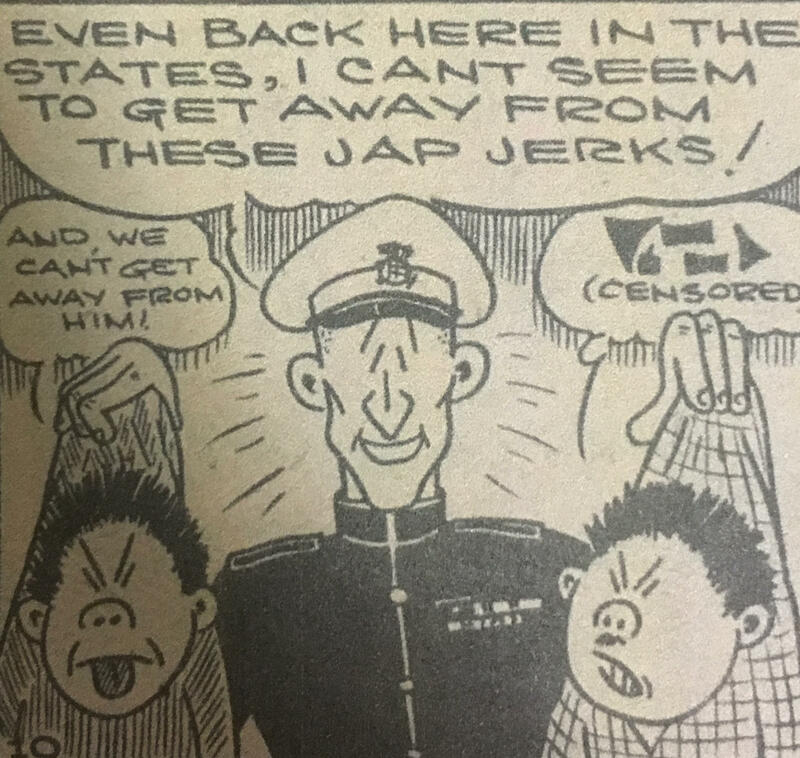 The so called “Jap problem” (38) was based in little more than hateful rumors and speculation that those of Japanese ancestry were waiting for a signal to betray and attack Canada from within. This, of course, resulted in one of the darker chapters in Canadian history, the forced internment of Japanese Canadians by the Canadian government. 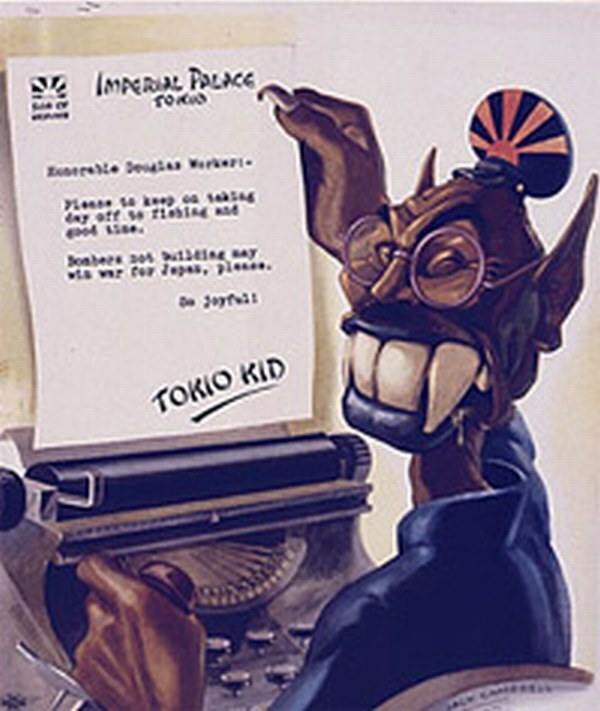 “Between 8 December 1941 and 31 March 1949, Japanese Canadians were uprooted from their homes, deprived of property, possessions, dignity and civil rights, including the rights to work freely, to vote, and in the case of those who were subsequently ‘deported’ to Japan, to their status as Canadians” (Kobayashi 2). According to Sunahara, in February of 1942, just one month after the infamous attack on Pearl Harbor, the Federal Cabinet of Canada ordered the expulsion of Japanese Canadians living from within 160 kilometers of the Pacific coast. It just so happened to be where the majority of Japanese Canadians lived and 22,000 Japanese people were displaced. The Japanese population of Canada was scattered across the country, spread across internment camps and long abandoned ghost towns, robbed of both their physical possessions and their dignity in retribution for the actions of a country they had few ties to. 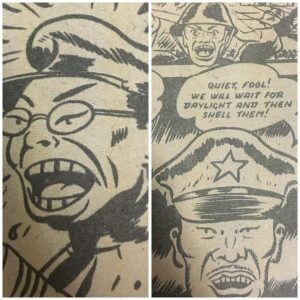 These motifs of dehumanization and vilification can seen throughout Dime Comics No18, which reflect the attitude toward of Japanese Canadians, which resulted in the mass displacement, internment, and violation of their basic human rights. 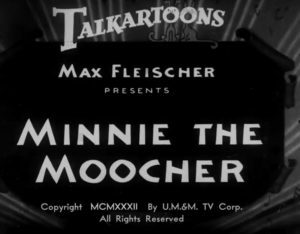 By vilifying the Japanese to a cartoonish degree, the Canadians of the 1940’s justified these unjust actions. 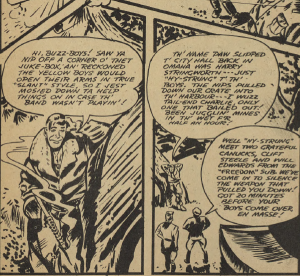 The Canadian Whites, especially the stories within Dime Comics No18, are reflective of Canadian culture at large. 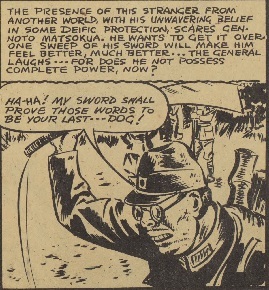 The depictions within the Whites of the Japanese people as vile subhuman, unintelligent savages, whom characters kill with the same guilt as one has for killing a rodent, shows us the exact attitude which existed within Canadian culture at the time. Bearing in mind that the majority of those who read the Whites were civilians who were locked in a state of paranoia about a war half a world away, it’s no surprise that their prejudice would turn on landed Japanese immigrants and second generation Japanese Canadians. The Whites reflect this theme of hate, bigotry, and dehumanization, which permeated Canadian culture and lead to one of the most shameful episodes in Canadian history. Kobayashi, Audrey. “The Japanese-Canadian Redress Settlement and its Implications for “Race Relations”.” Canadian Ethnic Studies = Etudes Ethniques au Canada, vol. 24, no. 1, 1992, pp. 1-19. Periodicals Archive Online, http://ezproxy.lib.ryerson.ca/login?url=http://search.proquest.com/docview/1293139767?accountid=13631. Billig, Michael. “Henri Tajfel’s ‘Cognitive Aspects of Prejudice’ and Psychology of Bigotry.” The British Journal of Social Psychology, vol. 41, 2002, pp. 171-88, Nursing & Allied Health Database; ProQuest Sociology Collection; Science Database, http://ezproxy.lib.ryerson.ca/login?url=http://search.proquest.com/docview/219174061?accountid=13631. Sunahara, Ann Gomer. 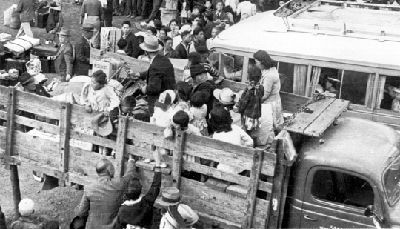 The Politics of Racism: The Uprooting of Japanese Canadians During the Second World War. Toronto, Ontario, James Lorimer & Company 1981. La Violette, Forrest E. The Canadian Japanese and World War II: A Sociological and Psychological Account. Toronto, Ont, University of Toronto Press, 1948. “World War Two & Interment.” Www.sedai.ca, SEDAI: The Japanese Canadian Legacy Project, www.sedai.ca/for-students/history-of-japanese-canadians/world-war-ii-internment/. Accessed 28 Mar. 2017. Dingle, Adrian (w, a). 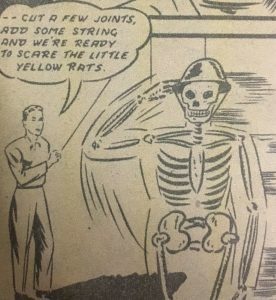 “Rex Baxter and Xalanta’s Secret.” Dime Comics, no.18, December, 1944, pp. 2-7. Canadian Whites Comic Book Collection, 1941-1946. RULA Archives and Special Collections, Ryerson University, Toronto, Canada. Brunt, Harry (w, a). 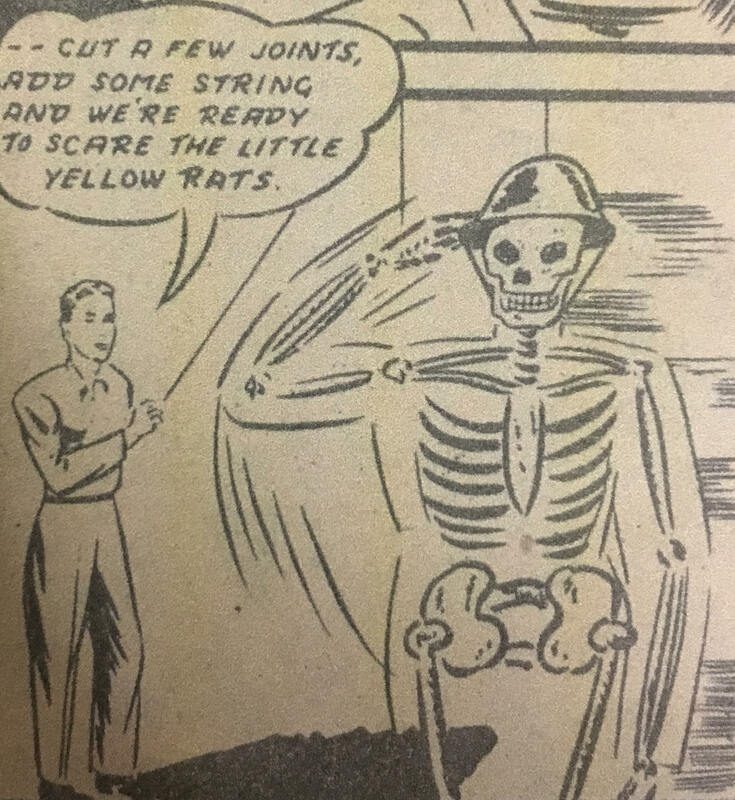 “Lank the Yank.” Dime Comics, no.18, December, 1944, pp. 8-9. Canadian Whites Comic Book Collection, 1941-1946. RULA Archives and Special Collections, Ryerson University, Toronto, Canada. Bachle, Leo (w, a). 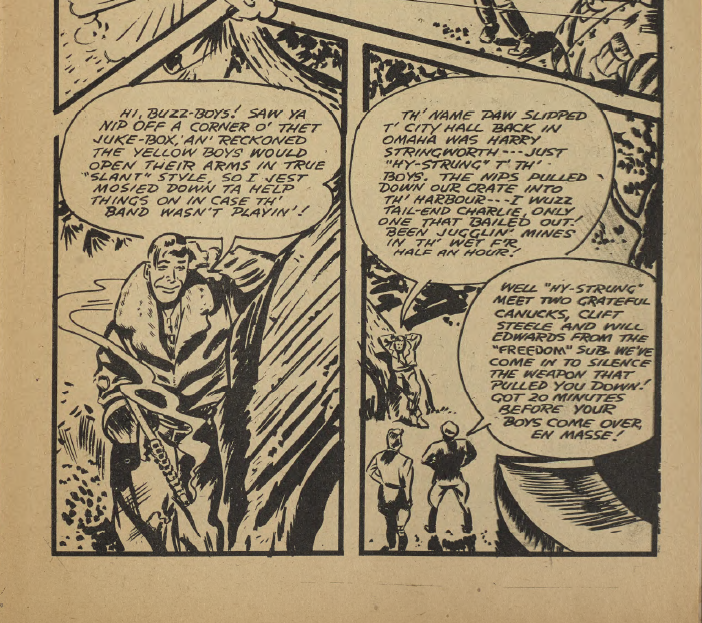 “Johnny Canuck.” Dime Comics, no. 18, December, 1944, pp. 41-47. Canadian Whites Comic Book Collection, 1941-1946. RULA Archives and Special Collections, Ryerson University, Toronto, Canada.